Here's another stab at the Robot Lord character design. 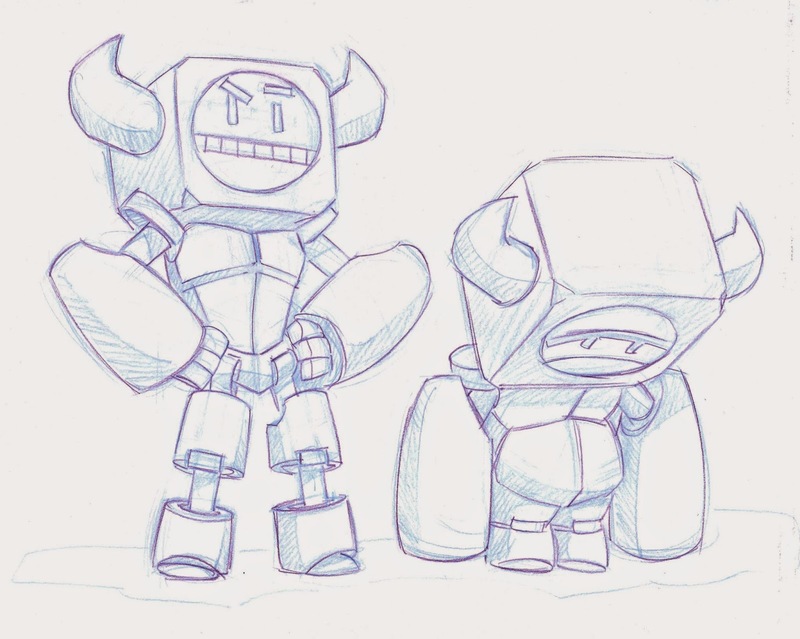 I did a drawing somewhat like the one on the right and thought it was pretty funny, which gave me the idea that perhaps this character can extend his limbs so that he can be tall or short depending on his mood, inclination or what he needs to do. One challenge with this idea is how do I shape his torso and hips so that it can be lean like a hero or rounded and pudgy like a toddler? I might do a CG mock up to see if it would work. You can see I kept the cuboid head with the face circle. Not sure if his limbs should be more boxy to reflect his head shape. Perhaps I'll try that next. But as usual, let me know what you think! I think I like the guy on the left and LOVE the guy on the right. If your story is for kids and if it's a funny story, I think you should go with the loveable little schlub. If he has to get mean for story's sake, your idea of having him stretch and grow is a great idea. You can have your cake and eat it, too! A bad guy who is also funny and sympathetic is the best kind of bad guy for kids. I like the way this thing's going! Thanks! I thought it might be a funny thing to see this big bad guy being a sourpus pouting. Sort of reflects how we can all be when we don't get things our way. And it would be great to see him just collapse into this pudgy, little loser guy. This is a winner! Glad to hear you like him. Thanks for the help.